A new study showing the relationship between the circadian clocks and autoimmunity hints at a potential lifestyle fix to help quell the fires of autoimmunity. The study, published in Nature Communications, found that disruption of the circadian clock in myeloid cells by removal of the gene BMAL1, which teams up with CLOCK to function as a primary regulator of the clock, increased the severity of a mouse model of multiple sclerosis. BMAL1 works to help regulate many aspects of the circadian clock, but of particular interest in this study is how it helps regulate inflammation throughout the day. While it may seem intuitive that loss of the circadian rhythm may naturally decrease inflammation, the opposite is true. When the circadian rhythm of inflammation is lost, inflammation cranks up. There are a couple of really important takeaways from this study that could be used to prevent, reduce the symptoms of, and potentially cure autoimmune conditions. First, and probably most obvious, pay attention to your circadian rhythms and do what you can to prevent circadian disruption. I cover some of the basics and how that ties in to gut health here. Another interesting tidbit involves those myeloid cells. 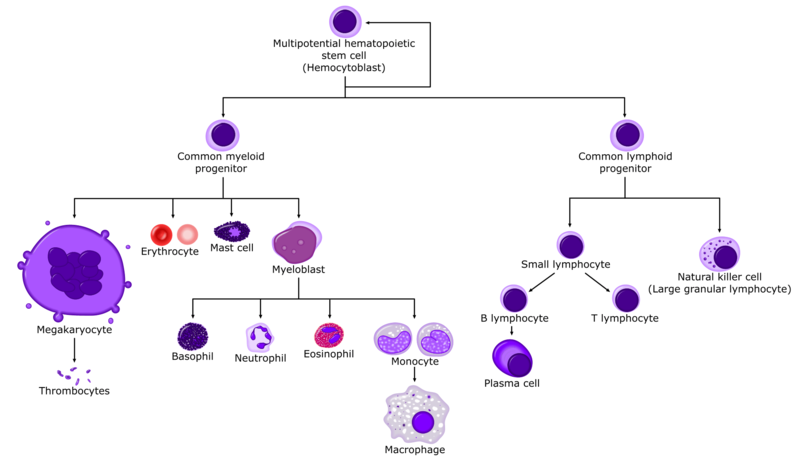 Myeloid and lymphoid cells are the cells that make up our blood and are both derived from hematopoietic stem cells. Generally speaking, as we grow older our blood cell population shifts to become more myeloid cell dominant. This shift is believed to be a major contributor to age associated immune dysfunction and may tie in to the increased risk for autoimmunity tied to aging. One of the known benefits of fasting is a shift in the fate hematopoietic stem cells take. Specifically, prolonged fasting tends to promote a more youthful balance in the ratio of myeloid to lymphoid cells in the blood. Actually, truth be told, fasting doesn’t do this. Fasting increases hematopoietic stem cell number and the refeed causes lineage commitment towards a more balanced system. This is very interesting for another reason. During fasting, we believe there is destruction of damaged cells throughout the body to recycle damaged proteins for use as fuel. I’m making a huge assumption here, but it seems more likely that cells that are out of sync with the rest of the cells of the body are more likely to be damaged, and thus, removed. Timing the fast and refeed appropriately could potentially knock out cells that aren’t playing ball and repopulate your blood with cells that are primed for circadian entrainment. From there it’s up to you to start paying attention to your circadian rhythms. Do you want to harness the power of circadian rhythms but don’t know where to start? Luckily, I have a program to help you do just that. The program is over 7 hours of video covering the many aspects of circadian rhythms and what you need to do to optimize your health. I cover light exposure, physical activity, exercise, critical nutrients, coffee, improving blood glucose levels, you name it I cover it. The program is $127 and you can purchase by clocking the Donate button below. The program price includes all current future modules as well an invite in to the private Facebook group where I help people along the way and give deeper analysis of my blogs. What are you waiting for? Could sealing the blood brain barrier and gut really be this easy?